This is a one-page summary of the Little Albert experiment conducted by John Watson. A worksheet for the reading is attached. The reading explains the backdrop for the experiment, a summary of events of the study, the ramifications of removing Albert from the experiment, and a 2010 update on the fate of Albert. 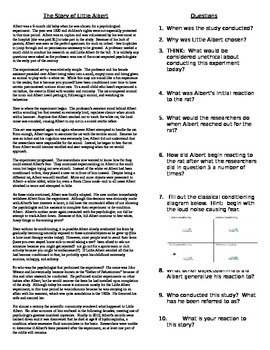 The questions cover a mix of topics, ranging from asking students about the main facts of the experiment, requiring them to create a classical conditioning diagram of Albert's fear, and having them reflect on their own views regarding the experiment. This would probably best be used after introducing classical conditioning in a AP Psychology/Psychology courses. If you are interested in a PowerPoint presentation covering the Classical Conditioning experience, please click here.